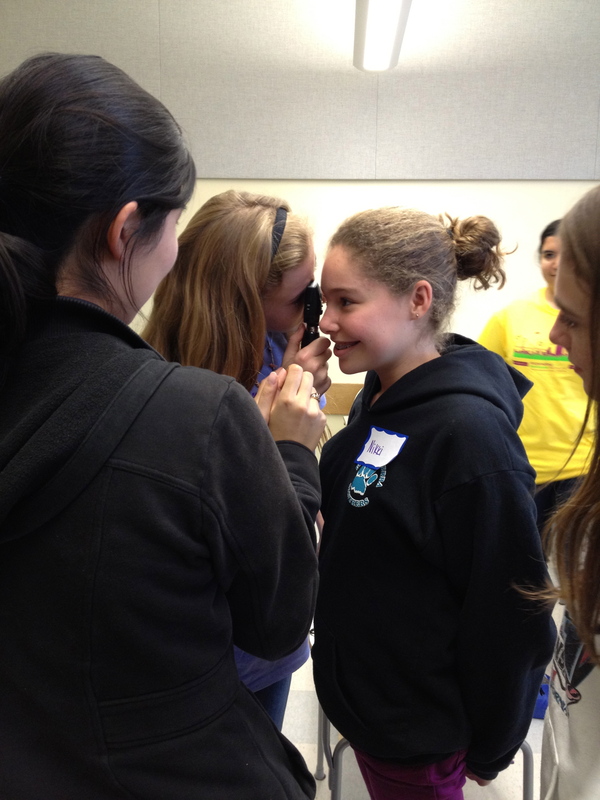 Is your middle school daughter interested in science, technology, engineering or math? 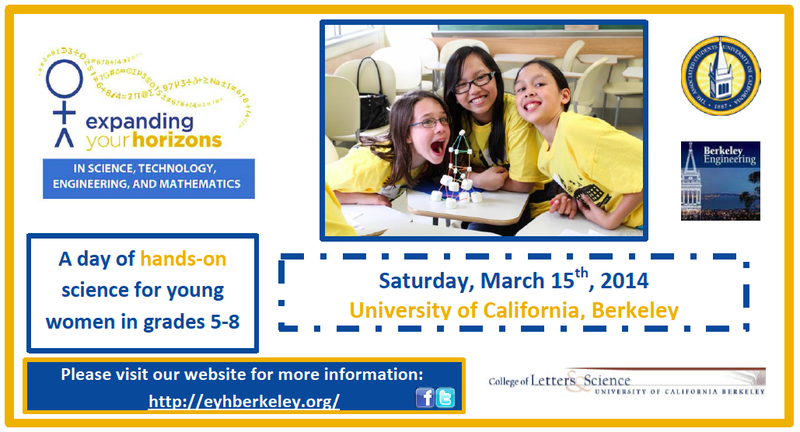 If so, there is a terrific local opportunity to further that interest being held on the UC Berkeley campus Saturday March 15. “Expanding Your Horizons” (EYH) is a national non-profit program created to motivate women in science, technology, engineering and math (STEM) education. Over 26,000 young women participate in Expanding Your Horizons events every year, with UC Berkeley hosting an event for the third time this year. Mark your calendar – enrolment for this popular event opens February 17, 2014. During the day long event, participants will hear from UC Berkeley professors, graduate students and industry professionals covering biology, chemistry, physics, engineering and other STEM-related fields. The event includes fun, hands-on activities. Students choose three different workshops from a broad selection, attend a keynote presentation and end the day with an undergrad college panel. Last year’s event concluded with an inspiring presentation by GoldieBlox CEO Debbie Sterling. Parents are recommended to register their child early as this event is expected to be very popular; online registration opens February 17 and is available here. For inspiring interviews with women in science, technology, engineering and math, ready more in OneDublin.org’s popular Women in STEM Series of articles. Las Positive College in Livermore is separately hosting the Tri-Valley Expanding Your Horizons event on February 22, 2014. Note that registration for the 2014 event as Las Positas College is full. Read more here. All Creatures Great and Small: This workshop will introduce students to a career in veterinary medicine. Students will learn about the diverse opportunities available in the field of veterinary medicine by speaking with veterinary students and engaging in hands-on activities with live animals. Beyond the Field: Sports Medicine and Athletic Training: This workshop will provide an introduction to the field of athletic training and sports medicine in a collegiate setting. You will learn about the role of the athletic trainer and sports medicine professional, how trainers combine sports and science, different opportunities for those interested in sports medicine, and a look at a typical day for a collegiate athletic trainer. You’ll get to test your skills by practicing different taping techniques used for injury prevention and management in an athletic setting. Brain Changing: How adaptable is your brain? Experiment with prism glasses that alter your vision to find out! Learn the neuroscience behind how and why your brain changes and discuss what your findings mean for how your brain learns every day. Crazy Chemistry: It’s hot, it’s cold! Come explore a career in chemistry. You’ll learn about hydrogen, bioluminescence, nylon, and liquid nitrogen. Come and make your own polymers! Digging the Past: In this workshop girls will get hands-on experience with how archaeologists use archaeological materials to study how past people lived their daily lives. Fishing for a Living: How do we know what Albatrosses eat? 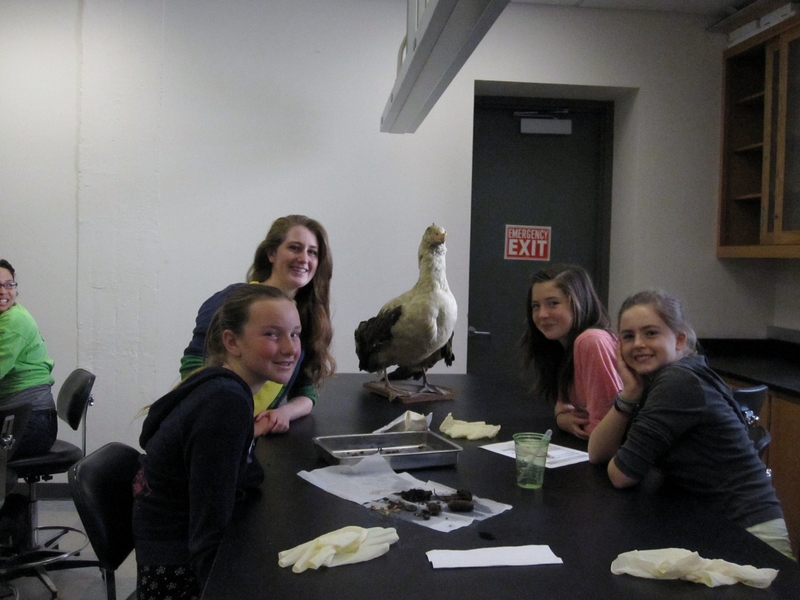 Be a bird biologist and try your hand with bolus dissections and satellite tracking to investigate the diet and chick rearing habits of the amazing Albatross. We will use techniques used by scientists who study these birds to understand what they are eating and where they are migrating so that the species can be protected. Fling That Thing: In this Taste of Techbridge session we’ll put the fulcrum and lever to good use, building personal catapults, and flinging sweet treats into our targets (our mouths!) We’ll also learn about engineering careers in a theme-park setting. Get ready for some fling-worthy fun! GeoGirls! : A geospatial workshop connecting girls with technology, nature and geography. Learn how to use a GPS (Global Positioning System) to navigate the world around you. Explore your world with Google Earth and learn how satellite and computer technology can be used to understand complex environmental issues. Girls on the Mic: Explore the careers of Recording Engineers, Music Producers, Live Sound Engineers and more. Learn to record and produce music, create sound for video, and set up sound for a live concert. Come ready to make some noise at Girls on the Mic! Googles of Fun: In this session, we’ll explore how the Internet and online technology improves people’s everyday experience. Come meet Google experts and learn how to envision, design, and develop useful products that solve problems. 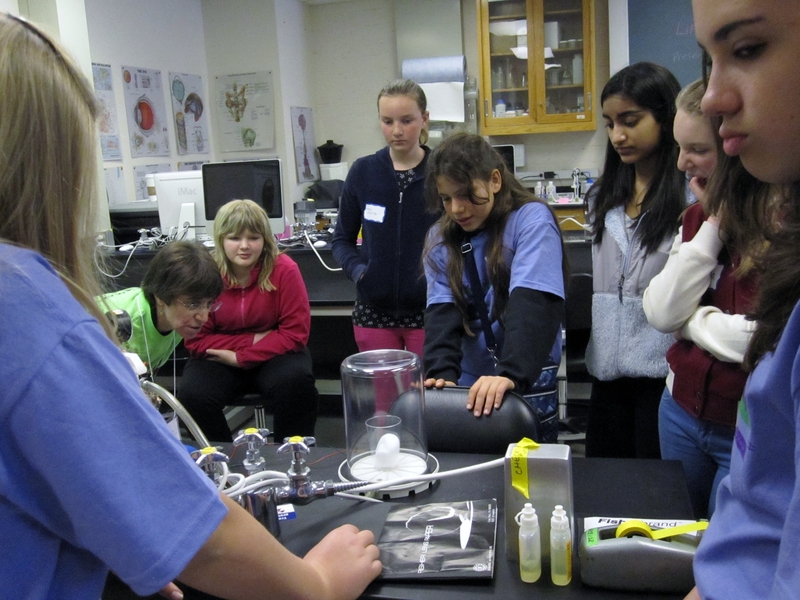 Go with the Flow: In this workshop, girls will get hands-on experience on creating microfluidic devices and learning how fluid flowing through these devices is different from fluid flowing through water pipes. How Machines Move: Cranes, excavators, elevators, and car lifts – Come learn about how hydraulic systems work. Test you mechanical engineering and design skills as you design, build, and test a hydraulic system to make your invention move. Intro to LED Light Circuitry: We’re planning to get breadboards, resistors, and different LED lights so the girls can get an intro to circuits. Life in a Vacuum: What is Vacuum? How does Vacuum affect our Life? You’ll put ice, water, and steam together in a beaker and coat pennies with different colors to learn about how vacuums work. Watch marshmallow Peeps blow up in a bell jar! Lights in the Sky: Students will be introduced to optical phenomena visible in the night sky, namely aurora and airglow, through a variety of hands-on demonstrations involving magnetism and exploration of the spectral properties of light. Make It and Break It: Explore the world of Environmental Design using everyday objects. As a team, make a simple structure and test it. The last team to “make it break” wins the game! My Instagram Collage: This workshop will introduce students to a career in software engineering and web design. Students will learn the basics of building a web application by creating a photo-sharing/manipulation app. Each student will use their own personal photos (or select their favorites from our collection) to create a downloadable photo collage! Nice Genes: This workshop introduces students to the field of molecular biology. Each student will extract their own DNA in a fun and easy experiment, while learning about the science behind the process. Let’s see what you are made of! The Art in Science: Did you know creativity is a key part of science? Art and science come together in this workshop to show you how science is not that different from art! You’ll learn why creativity is so important to scientists when they ask questions and solve problems. You’ll also get a chance to see art made by current scientists and hear the stories about their lives, and then you will get to make your own art to illustrate your favorite scientific topic or idea! This is the Life in Space: Ever wondered how to become an astronaut and actually go to outer space? Come meet a real astronaut to learn about the interesting aspects of space exploration, and how science is used to approach and solve these out-of-this-world problems. Through the Looking Glass: Intro to programming with a 3D programming environment called Alice. Why Things Break: We will use a series of interactive demonstrations to explore why materials do not always act the way you’d think they would. This workshop is for girls who are interested in materials science and engineering. Las Positas College also has an EYH Conference this year, if you don’t want to have to travel so far to get to UC Berkeley, but have the same great experience. Patty – we didn’t include the Tri-Valley Expanding Your Horizons event in the original article because registration was full at the time this article was published. We have updated the article with a link just in case there are wait list opportunities and will include an article on the Las Positas College Tri-Valley EYH event next year. Thank you for the feedback.